At 11am started from Market Cross with Bert in Tipper's wagonette for Totmonslow to attend cut of first sod of the Cheadle Railway. After came home in procession thro Tean to Cheadle. Evening to auction of late Charles Hickenbotham's property in Chapel and Charles Street. 4 cottages fetched 483 pounds. I passed a few suitable remarks about this property and the Cheadle Railway. J.S.(T.S.?) Godwin, executor, present and C.J. Blagg read the conditions. Mr Green, Freehay, bought for Charles Weston. Mr Godwin, executor, asked me to bring my Bill for selling into him. Walter Almond came over from London and called upon me. 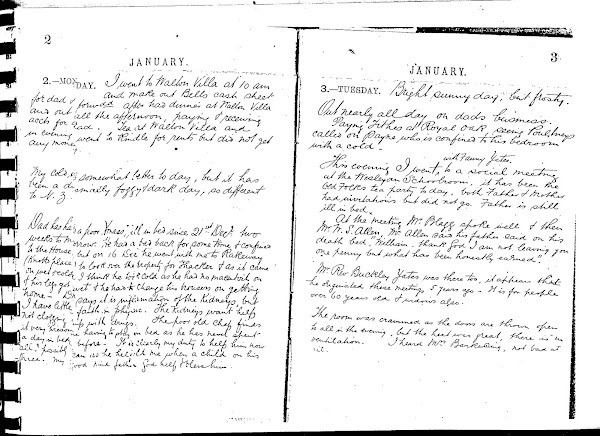 1) Walter Almond was John's brother-in-law, married to his sister Elizabeth. 2) The construction of the Cheadle Branch line was not fully completed until 1901. Anyone interested in the story of the Cheadle Railway should try and get a copy of 'The Cheadle Railway' by Allan C Baker. The last train ran up the line in 1985 but some of the track,now heavily overgrown, is still in place. These days, with our cars, it's easy to forget how important trains were in those days. 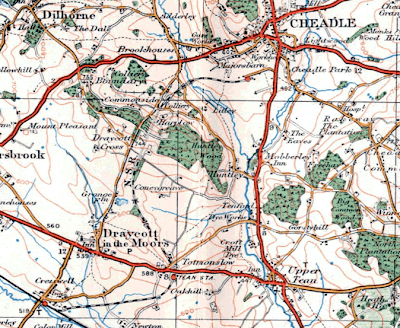 To go anywhere far away in 1888, you had to take the train and the nearest train stations to Cheadle were Blythe Bridge and Oakamoor, which were a few miles walk away or what must have been a relatively-expensive ride in a horse and carriage. No town could be considered very important without a railway station, so it's quite easy to understand why many people from Cheadle went to see the start of the construction of the branch line. They went back to Cheadle in procession - I could imagine a bit of a carnival atmosphere. You couldn't imagine people turning up these days to witness the start of construction of a new road. in addition to Alan Bakers excellent book on the Cheadle Railway, he also published a book entitled the Cheadle Collieries and their Railways, its a must read for any one interested in the fascinating history of the Cheadle Coalfields. I recently walked the route of the Cheadle Railway, all the track has been lifted and scrub cleared, its now possible to walk the full route from Cresswell to Cheadle via Totmonslow Station.The company who purchased it intend to reopen it.